Sweet Bartlett pears are paired with tart cranberries for a tasty twist on the traditional fall fruit crisp. Our delicious Pear-Cranberry Crisp recipe features a spiced pecan topping and is best served warm with sweetened whipped cream. 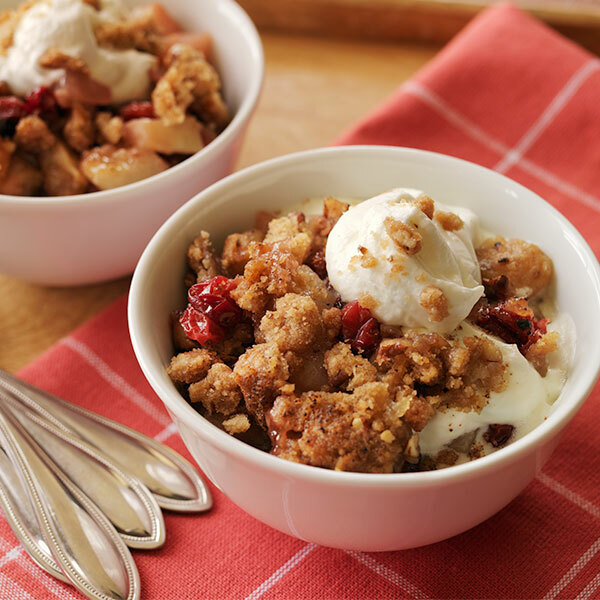 One bite and you'll want to serve this Pear-Cranberry Crisp as a delightful dessert alternative to pie this Thanksgiving! Preheat oven to 375°F. In large bowl, toss together pears, cranberries, granulated sugar, crystallized ginger and lemon juice. Transfer to 9-inch square baking pan. In food processor, combine flour, brown sugar and nutmeg, and pulse to blend. Add butter and pulse until mixture resembles coarse crumbs. Add pecans, pulsing until just combined. Sprinkle mixture over pears. Bake 55 minutes or until fruit is bubbling and topping is crisp and golden brown. Cool 10 minutes before serving. Serve with sweetened whipped cream, if desired.